Once you've built your system, use this guide to start growing! This guide is a set of recommendations only. Each +Farm is going to be operated in different ambient conditions, and growing different combinations of plants. The best way to understand how to manage your farm is through a combination of observation, taking notes, and trial & error. Use the information in this guide as a starting point but adjust it based on the specific conditions that pertain to your +Farm. This guide is written for the home or educational user, not commercial farmers. If you are a commercial grower, please double check that any suggestions for products or methods in this guide align with methods you’re required to follow. To begin growing your plants, they must first germinate and grow into seedlings. Afterwards you'll transplant them into your +Farm. Hydroponic plants grow in a substrate which is used to provide them with support and maintain an optimal moisture/oxygen balance while they are developing. Common substrates in hydroponics are rockwool, coco coir, sand, sawdust, clay balls, perlite, lava rock, peat moss, burlap, cloth and foam. 1. To prep your media for planting, first read any instructions. Some media need rinsing or a pH adjustment prior to planting. Rockwool is an example of a media that needs pH adjustment. Follow directions on the package for properly conditioning the media. Once ready, place the media in a seedling tray. 2. Plant 2-3 seeds per cell. Seeds should be dropped into the hole in the center of the cube. Planting more than one seed per cell helps improve the chances that at least one will germinate. Water your seeds with a spray bottle and add a small amount of water to the bottom of the tray (¼-½” deep). This will make sure cubes stay moist. 3. Once the seeds are planted, make sure to mark what was planted. This will make it easy to remember where each variety is so you can monitor the development of each crop. 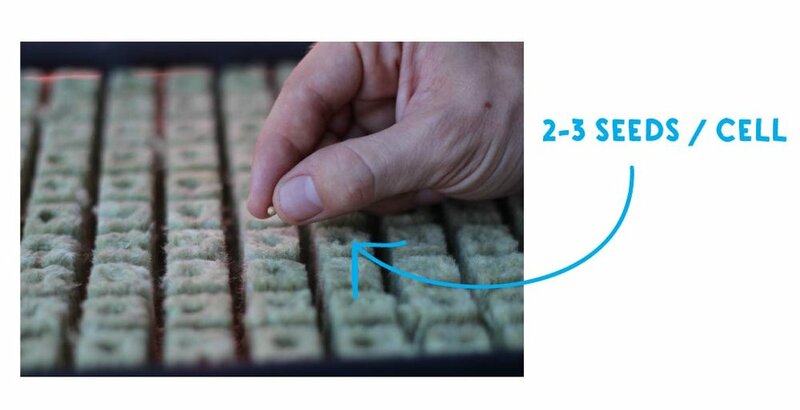 Simply mark the variety’s name on a piece of tape or other marking medium and place it on the corresponding planting tray. 4. Cover nursery with another black plastic tray (flipped upside down). This will keep the seeds in the dark (most seeds require darkness to germinate) and will help keep them moist. Seedling trays will germinate best if they are in a warm location. If your house is warm, then likely they will germinate easily anywhere. If they are in a colder area, such as a cool garage, it is best to put them in a warm (but not hot) spot. A good place is on top of a refrigerator. If there isn’t a suitable spot and seeds are not germinating well, you can buy a small heating mat that goes under the seedling tray, plugs into the wall and keeps seeds warm. 5. Check on seedlings each day, adding water to the bottom of the tray so that there is at least ¼ “ of water. If your seedlings are on a cement floor, make sure to put a layer of insulation under them (this can be foam, carpet, cardboard or other isolating material). 6. As soon as the majority of the seeds have germinated, they need to be exposed to light. Remove the black tray that covered the seedlings and replace with the clear dome tray. The recommended distance between the light and the plants in this germination system is three to six inches, or about the width of your hand. 7. Now, turn on your 2 foot germination light. Light should be about 6” above seedlings to start. Make sure there are some small holes in the top of your clear dome to allow for heat and moisture to escape. If you don’t have a light, plants can be put next to a window where it doesn’t get too hot. 8. Once seedlings are exposed to light, it is important that they also have nutrients to be able to grow well. Seedling should be given a highly diluted nutrient solution. A solution that is too strong will likely kill seedlings. Prepare a nutrient solution with an EC of 0.5 or less and use this to feed your plants. Put about ¼” of solution in the bottom of the tray. Each day top off with water and then add a bit more nutrient solution as needed (measure EC). If you aren’t measuring your EC, be very conservative in adding nutrients. It is easy to kill plants with too strong a solution. Follow instructions on fertilizer package. 9. As they get older and larger, the nutrient concentration can be increased gradually until it reaches the ideal EC as described in the crop EC table. Please note that if you are using “organic” nutrients, the EC reading will be about half of that of synthetic nutrients. For seedlings, EC should be 0.2- 0.3 with organic nutrients. While EC changes with the age and size of plants, the pH should remain pretty constant for the life of the plant. After mixing your nutrient solution to the right concentration, then adjust the pH so it is in the 5.5- 6.5 range. 10. Once the tray is planted, store the unused seeds in a cool, dry place. Storing the seeds in a refrigerator is ideal, but a cabinet away from direct sunlight, hydroponic system light, and excess humidity will work. Generally seeds are in their prime for about one year, although some seeds may last longer depending on manufacturer and type. Storing the seeds in an appropriate place will increase their effectiveness. Your seedlings are ready to transplant into your +Farm when the roots begin to exit the grow media (grow cubes) that they are planted in. This will generally take a couple weeks. To check, gently lift your grow cube out of the seedling tray and observe the outside. Are there any roots growing out? If so, plants are ready or nearly ready for transplanting. If not, put them back into the seedling tray and check again every couple of days. If they are ready to transplant, simply pop out and separate the cubes and transfer them to the rafts. Please note: If any plants do not look healthy, do not transplant them into your +Farm. Pests and diseases can spread very quickly in the +Farm so it is best to never introduce pests or diseases if possible. Dispose of any plants that appear to have diseases or pests. If you are in doubt, please toss them out. The reservoir holds the water and nutrients that will feed your plants. Understanding, monitoring and controlling what is happening in your reservoir is key to keeping your plants growing well. Fill your reservoir with cold water and then turn on your system pump. Allow water to circulate through the system and continue to add water until all flood trays are full. Allow the system to run with water for at least 30 minutes to make sure water levels are correct and everything is functioning correctly. Here are some recommended EC levels for mature crops (not at seedling stage). Once again, your observations are the best tool for getting the right EC for your plants. If the EC is too low and plants aren’t getting enough nutrients, plant growth will suffer and leaves will be misshapen or discolored. If the EC is too high, it will often cause “tip burn”. This is a yellowing at the leaf tip followed by browning/dying of the leaf tip. If you are using tap water, it will likely contain a low level of salts. If you are using filtered water, these salts will likely be removed. In either case, measure the EC of your water before adding nutrients. If the EC is 0.1 and your target EC is 2.0, then adjust your target to 2.1 to include the base level of salts in the water. Add your nutrients (following directions on the nutrient package). Mix well in the reservoir and allow water with nutrients to flow through the entire system for at least 30 minutes. Then, check EC measurements again and if needed, add more until you reach the right level. Remember that after each time you add nutrients to your reservoir, you need to allow water to cycle through the entire system to get an accurate reading. If EC is too high, dilute with water or remove water from reservoir and refill with fresh water. As a reminder: make sure your EC meter is calibrated and probes are clean (see manufacturer instructions). Once your EC is adjusted properly, it is time to move on to adjusting pH. In chemical terms, pH refers to the ratio of hydrogen (H+) and hydroxyl (OH-) ions in solution. In other terms, it tells us how acidic or basic the nutrient solution is and uses a scale of 0-14. Pure water has a pH of 7.0. Any reading above 7.0 refers to a basic (alkaline) solution and any reading below refers to an acidic solution. Most plants grow best with a pH between 5.5 - 6.5. As pH leaves that range, chemical changes will lock up certain nutrients and make them unavailable to plants, which may result in a nutrient deficiency. After filling your reservoir and adding nutrient solution, check the pH and adjust using "pH up" or "pH down" solution. Add a few drops at a time, mix well and let your system cycle for several minutes. Measure again and adjust until it is in the correct range. Note that pH will fluctuate based on the chemical processes in your system. This is totally normal. Most people notice that their system pH will tend to drift consistently in a certain direction. If that is the case for your system, you may want to adjust your pH starting point to the lower or upper end of the pH range so that a day’s drift will keep pH within the acceptable range. The pump that is located in your reservoir circulates water throughout your +Farm grow beds. This water carries important nutrients and oxygen to plant roots. For this system, we recommend that your pump run continuously, especially when you are first learning to operate your farm. Your pump keeps the water moving. If the pump is off, then water is not being replenished and sitting water becomes devoid of oxygen, slowly causing roots/plants to drown. Depending on your +Farm setup, understanding the dynamics of how much water is in the reservoir and in the grow beds can be confusing. If the pump is running continuously, it is easier to maintain this balance. If the pump turns off and on every few minutes, this balance is harder to maintain and spills/overflows are more likely, especially with a deep water culture system. Make sure there is always enough water to cover the intake portion of your pump. If there isn’t, you will likely hear the pump sucking air, which will damage the pump over time. Your pump has a small mesh or plastic filter that keeps larger particles from getting into and clogging the shaft. These particles can clog your filter, leading to reduced performance and reduced water pressure. It is important to open up your pump and wash out filters and any gunk that has accumulated every time you clean your reservoir or or whenever you find any problems with water pressure or flow. The goal of the air stone is to increase oxygen levels in your water. The air stone should be located in your reservoir and working continuously. This will allow water circulated by the pump to have a higher level of oxygen. Note: some air stones can be adjusted. If this is the case with yours, start cultivation with a medium level of aeration and adjust up or down as you see how plants respond. Air stones can also be added to the beds of this system. If this is the case, the pump can be run less frequently. It’s very important that the lights are kept the correct distance from the plants. Too far away and the plants will be starved for light. In response, they will reach towards the light and elongate, making the plants spindly, weak, and unhealthy. Too close and they will be burnt by the heat the lights give off. LED lights are much cooler than fluorescent lights so they can be much closer to the plant without burning the leaves. Some growers attach pulleys to their lights so they can keep them the optimum distance from their plants and raise them as the plants grow. It is also important to understand where your light is going. Is it reaching all of your plants evenly? We recommend starting with your lights 4” (four inches) above your plant canopy (tops of leaves). Make sure light is reaching all plants but leaves are not getting burnt. Adjust lighting as needed. Actual light reaching all plants and leaves will differ based on the density of planting. Thus it is important to measure DLI at the leaf canopy and also in lower areas that don’t get as much light. The number of light hours per day is an average recommendation based on the type of plants. Use a timer to control your lights (Please see specific instructions for the timer/ smart outlet you are using to program correctly). Electricity rates may vary greatly during day and evening hours in your location. Running your farm lights at night when energy costs are low may present a big costs savings. Look into details in your locality. Your +Farm may be located in any one of a number of places- classroom, living room, greenhouse, closet, garage- the possibilities are endless. Each of these locations presents a set of specific environmental conditions. To thrive, the +Farmer needs to be aware of and understand these conditions as much as possible, and make adjustments to the +Farm in accordance to these conditions. How does each one of these factors affect my plants and my +Farm? The table below shows how these factors influence your plants. Depending on where your +Farm is located, air circulation may or may not be an issue. Even so, it is important to understand why air circulation is important and how it can help your plants grow. Air circulation is important for a number of reasons. There are different ways to lower humidity. First try circulating your air and exchanging air with an out-of-farm area. For example, if your +farm is in a closet, try adding a twin fan that will pull dry air in from another room and push out the warm wet air from the grow space. If air circulation doesn’t work, you may need to purchase a dehumidifier. Dehumidifiers are a very reliable option. Note that dehumidifiers blow out warm dry air which can damage leaves. Make sure the air is directed in an appropriate way. Also, they do use a fair amount of energy so this will add to your electrical bill. Small insects will find a nice, cozy home in your new +Farm. After all, it is warm and moist in there. Common pests include: aphids, caterpillars, spider mites, fungus gnats, whiteflies, thrips and others. Pests can be identified in two major ways: either by sighting actual pests, or through the presence of eggs or larvae on the underside of the leaves and/or stem of the plant. Pests are often attracted to plant matter, living or dead. It is very important to remove plants from the system when they are ready to harvest and to remove any dead or dying plants from the system. Biomass in the system serves as a food source for pests, so reducing its presence is paramount in preventing infestation. Keep all surfaces clear of plant matter and other debris. Some growers hang a sticky trap or two in their farm. This is a good way to see what insects are present. As the roots develop, take a look at them every so often. If algae is growing on the roots, it could be inhibiting plant growth. If the roots are turning black, a virus called pythium, also known as root rot, may have infiltrated the system. A single case of black roots does not necessarily indicate that pythium is in the system. Generally, pythium causes plants to die and will spread to other plants. The presence of pythium also necessitates a system cleaning and flush. After several weeks, your plants will be mature and ready for harvest! Some plants can be continually harvested using the “cut and come again” method. You may have to cut your plants out of the floating raft if the root mass is overgrown to avoid breaking the raft/damaging the plant. After harvesting, you may store the plants with roots intact in a cup of water in room temperature, and they will stay alive and fresh for 1-2 weeks. You may also store them in the refrigerator--just be sure to give produce a rinse before storing in the fridge. When you have completely harvested your system and it’s empty, it’s a good time to clean your system. It is important to completely change out the water in your system and clean your system on a regular basis to maintain nutrient levels and prevent diseases. To maintain the correct nutrient levels in solution. As plants grow they use nutrients in the solution, but they don’t use them evenly, so, over time, the solution ends up with an excess of certain types of nutrients and a shortage of others. This imbalance can harm plants. Water tests can be done to determine what is missing and those nutrients can be added back in, or, more simply, you can dispose of old solution and add fresh water and nutrients for your crops. To prevent diseases. Your +Farm may be in a space that is warm and fairly humid. These conditions are perfect for algae growth and growth of other bacteria and plant diseases. While algae growth isn’t bad, it does take away some nutrients from your plants, can smell bad, and is a breeding area for fungus gnats. We recommend you do system maintenance every 2 weeks when you begin using your +Farm. As you work with your +Farm and gain more experience, you may decide to do system maintenance more or less often based on what you observe in your farm. Eventually you should be cleaning your system about once a month. To clean the system, begin by turning off the pump and lights. Remove any plants and set them in a safe location away from foot traffic. Make sure plants are in a cool, shady spot as they can wilt quickly without water. Next, empty all water from the system by draining any remaining water from the grow space into the reservoir and then flushing the reservoir. Reservoir water is ideally used for watering your potted houseplants or outdoor plants (note: if your plants show any signs of disease, it is best to dispose of water down drain, etc). To clean the system, the main task is scrubbing with a scouring pad to remove algae and other debris. Add warm water (and a small amount of dish soap if desired) to make cleaning easier. Make sure to take the pump apart and rinse out all gunk in pump and clean the filter (this is easiest to do in a sink with a spray nozzle). Rinse trays well after scrubbing to remove all debris. If you have seen any signs of disease in your system, you should follow your cleaning with a hydrogen peroxide flush. The point of a flush with hydrogen peroxide is to inhibit disease that may be in the irrigation lines or the pump. Take a plastic 5 gallon bucket and fill half way with water. Add one bottle of 3% hydrogen peroxide (available at most grocery or convenience stores). With a sponge, wipe all bed surfaces with the liquid. Then, disconnect and remove pump from reservoir (or grow bed) and place in bucket to soak for at least 5 minutes. With pump oriented sideways or upside down, turn pump on and allow peroxide flush to circulate in bucket. Finally, dump flush into reservoir or lower grow bed and reconnect pump. Turn pump on briefly to flush irrigation lines as needed with hydrogen peroxide solution. Once cleaning is done, dispose of this water in a floor drain, sink, or toilet. Finally, refill the reservoir with water, add nutrients, balance pH, add plants, and turn on the pump and lights again. Always monitor your system after cleaning to make sure everything is working properly, there are no leaks and there is sufficient water. Note: Hydrogen peroxide is not toxic to plants and can be beneficial by raising the oxygen levels in liquid. 3% hydrogen peroxide may have other chemicals to stabilize it and that is why we recommend disposing of the peroxide mix after running it through your system. Share what's growing in your +Farm with the world here!